Note: Review and if warranted, update the default replication for dse_perf keyspace. The default value might need to be increased. Enter a Threshold value to override the default. Queries that take longer than the allotted threshold value are recorded in the slow query log. To prevent excess overhead, the threshold must be higher than 15 ms. Enter a TTL in Time To Live to override the default. 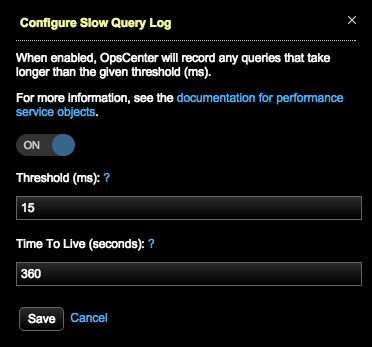 The TTL indicates how long the recorded slow query should stay in Cassandra in seconds.